I have been thinking about planning and new teachers quite a bit lately. When I was a new teacher, everything I taught was new to me, and I didn’t have enough time to plan. I think a lot of schools are a similar schedule: six periods a day, teachers teach five and have one planning period. Not nearly enough. Many teachers, especially new teachers, need to use time outside of school to plan. 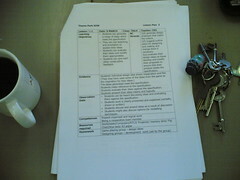 Of course, nowadays the Internet makes a wide variety of lesson plans available to teachers, and I imagine planning is much easier for student teachers and new teachers than it was when I started teaching; however, the quality of a lot of this material is mixed, and I think it might sometimes be hard for new teachers to be able to discern the quality of lessons. What can we do to help new teachers learn to plan? Mentorship: Model how to plan for units and lessons. Meet with new teachers to plan with them. I was provided with a bunch of templates when I was student teaching and sent on my way. It really took me years to figure out how to select activities that would meet learning objectives and instructional strategies for teaching those objectives. We need to be doing more of this in teacher preparation, and some time down the road when I am working with preservice English teachers, I will. Make them turn in their lesson plans: I expect many of you will disagree with this requirement, but I think regular feedback on and discussion about the lesson plans they create will really help new teachers. No one made me do that once I had my own classroom. In my first school, I turned in weekly plans to the Curriculum Director, but she never looked at them, or if she did, she never gave feedback. Of course I had to turn in lesson plans when I was student teaching, but once I no longer had to do so as a new teacher, I admit I went into the classroom winging it sometimes, and that’s not good. Engage in professional development with new teachers. Do a book or article study together. Discuss techniques. Our school is doing one on The Skillful Teacher to the left in the sidebar. It’s a good book: one I wish I had as a new teacher. Build in some sort of regular reflection: Jim Burke’s Teacher’s Daybook has space for reflection. Journals would work. For those who want interaction, I think blogs are perfect. My teaching has improved more than I can measure as a result of this blog. Those are a few of my ideas. I’m convinced that better planning will lead to better classroom management in many cases (some schools have administrator issues too large to compensate for, and I’ve been there and done that in the past). If we can help teachers become more effective planners, we might retain teachers at a higher rate than we currently do. What would you do to help new teachers? I agree with everything you said – even the lesson plans piece!! I have been thinking a great deal about planning lately as well – not just for teachers but for administrators. Giving feedback on lesson plans makes turning them purposeful – and gives greater insight into that teacher than the "dog and pony show" observation that so many rely upon. I also use Jim Burke's reflection planner – even though I am out of the classroom – it helps keep things in perspective and is a wonderful resource. Thanks for a great post – and one that I will share!! As a first year teacher, I've found it really helpful to see lesson plans of veteran teachers teaching the same courses at my school. Without these I often feel like I have no idea what to focus on besides what's in the teacher's edition of the textbook or what pops out to me in the state standards. I imagine that this problem might decrease with the rise of coherent curriculum (which has drawbacks as well). I am required to submit lesson plans weekly but I never receive feedback on them, so I don't see that as very helpful. It would be helpful if mentor teachers had an ADDITIONAL plan period concurrently with their … mentees? Mentos! heh. Anyway. So that they could sit down together and the mentor could sort of observe & ask questions as the new teacher brainstormed a unit plan. mrs. huff.. I really like the leadership and role modelness you show! you're the best!!! see you in class very soon! you look really nice in your profile pic by the way! This is a great post and launch point for new teachers. I have been looking for a great planner – thanks for pointing out the Jim Burke…I have been using one from Franklin Covey. I look forward to seeing this topic develop. First, I think any new teacher would be lucky to have you as their mentor, Dana. This is my second year teaching English, and I feel like you are one of my mentors, even though we have never met! Second, I think you're absolutely right about reflection and more guidance with lesson plans, especially in independent schools. I think the freedom we have in the classroom is great, but I think more guidance would certainly be helpful. Third, I am one of those newer teachers using the Internet as a lesson planning resource. I think that even though it is certainly a great tool, I do spend a lot of time finding, compiling, sorting, adapting and exploring online lesson plans. I think also it can be a helpful way to test what you know about yourself and your students– will the plan work for them? Is it the kind of plan I can use effectively? Does it suit me as a teacher? Great post, with lots of food for thought. I don't mean to diminish the growth that needs to occur to become a new teacher, but I wish everyone would lighten up about this. I think less supervision, rather than more, is best. I don't think it's about the amount of support at all, but rather the quality of the support. And I would say that just letting the new teacher, or any teacher, be without any support is a horrible idea. I haven't been to your site in a little bit. Seems like the format is more clean & inviting. I am currently a student teacher in a nine-month, intensive and experiential program in Juneau, Alaska. I have a full teaching load and attend graduate school full time. Planning fills my weekends and, when my Monday plans downward spiral, I spend a lot of time re-planning my week. I am so excited to find your blog. The access to lesson plans and resources is so helpful for a first-time teacher. My program is also technology based so this reformed luddite hopes to benefit from your technology tips as well. I absolutely agree about turning in lesson plans — if only for the fact that it creates a habit of actually writing lesson plans. Of course, getting feeback is the goal and should happen, but just the fact that a plan must be turned in will make any teacher focus a little harder on having a plan. I think too often teachers aren't really prepared each day for class, and that is a horrible shame. 45 minutes or more of a student's learning gone by. I am talking only about one extreme of teachers, of course, but it is one that really bothers me. I agree that new teachers, particularly those teaching English courses, are typically overwhelmed with the planning (and grading!) that goes along with their new courses. I think Clix's suggestion that new teachers should have an additional planning period with their mentor's makes sense–after all, the problem everyone seems to be noting is the lack of time. I do wonder if the problem is really just being a new teacher or if it stems from the discipline of English in general–even now, in my third year, I still find myself spending entire weekends planning and grading. A potential solution would be to adopt a program similar to a neighboring school district where English teachers have "conferenced English"–they teach fewer courses than other disciplines and spend part of their planning time talking with students about writing, thereby improving student performance as well. If something like that is unavailable, I think finding quality web and print resources to use can be the best use of a new teacher's time–I love the Shakespeare Set Free series for suggestions on making Shakespearean drama come alive for kids and anything by Jim Burke (Reading/Writing Reminders, 50 Essential Lessons, Letters to a New Teacher) is great too. Lately, I have also been reading Mechanically Inclined and Image Grammar–these are excellent resources for teaching style and mechanics to students. At East Carolina U., we're going to try having our entire area agree on one lesson plan format to use throughout multiple programs, in the attempt to lessen the confusion that new English teachers feel when we make them have to negotiate their professors' inconsistencies. It's posts like these that get me excited about working with new teachers and thinking of how I might best do that. So often the student teaching portion of teacher preparation isn't done in a manner that helps develop and improve the quality of teaching. As for turning in lesson plans, I'm defiantly against it. I'll gladly share and discuss my plans in great detail with colleagues and administrators but being required to turn in lesson plans solely as a method of accountability borders on demeaning. @Susanna Nobles: I agree that it's a bad thing for teachers to go into class without adequate planning, but I'm not convinced turning in lesson plans is the solution. Ben, I agree that it is demeaning to ask teachers to turn in plans if there is no sense that the purpose is about dialog and helping a teacher who might be struggling in that area grow, and I have had to do it in my career, too. I wonder what else, besides turning in lesson plans, could help a teacher who has a habit of going into the classroom unprepared. One could argue such a teacher shouldn't be teaching, but often, with some mentoring, they are able to learn the value of planning and become good teachers. At any rate, we should be doing something. I think Susanne's point that too many teachers wing it is valid. Todd, I'm so glad you're doing that. I know I was completely confused about how to plan when I was student teaching, and frankly, by supervising teacher wasn't much help because all I could see of her planning process was a few ideas sketched into her plan book. I never saw the large amount of work she had done because she had taught the same courses for years and it was all in her head. I teach 9th grade the same way, and I suppose that if I took up an American literature course again, it would be the same. What I needed was something more concrete, like backwards design or something. That would have helped me. Erin, you're dead on about the work load. The amount of writing English teachers must grade alone I think makes the planning and grading end of teaching English difficult. I have been using a GTD program called Things for Mac, and I have been scheduling due dates for grading assignments in it. It has helped me quite a bit, I have to say. Bud is, as usual, the voice of reason. We need to offer new teachers high quality support, and if that means setting aside time to plan with them, to model it, I think it's worthwhile, especially if we want to retain teachers. Yes, well, my position is that of skeptic. I have never heard of ANYBODY having a good student teaching experience, and I have heard many stories of outright harm. Mostly I think student teachers, given the stakes involved, do whatever is necessary to please the cooperating teacher, at the expense of learning their craft, if that were even remotely possible, which I doubt. I think that with the financial and career pressures involved, very little learning can occur even under the best of circumstances. I tend to think that student teaching has its greatest value in confirming that teaching may be for you—what you learn about yourself in the process—and vulnerable to the same criticisms of the SAT—little predictive value for the future, although they can point out who looks good right now. And the though of a bunch of teachers tring to agree on what "qulity mentoring" is, exactly, makes me want to head for the hills. All of this is also a sort of round-about way of saying that one of our greatest weaknesses as a group is never being able to view the world as anything but the good students we probably pretty much all were. You know, like we know it all, everything is perfectable, and perfection is an excellent goal. Pam , with all due respect, if this conversation makes you want to "run for the hills," I can't understand why you are contributing. It's not the disagreement but the lack of positive contribution. If you disagree that mentoring teachers is worthwhile, then what's you solution? What should we all be doing instead of helping these young teachers? I wanted to chime in to let Pam know that I had a great student teaching experience. I learned a lot, despite the financial and career pressures involved. I learned, in fact, that teaching involves juggling a lot of financial and career pressures to the best of your ability. I agree with all of your suggestions. As a literacy coach I enjoy working/planning with newer teachers (and older ones who tend to do the same things everyday) as well. The turning in of lesson plans seems like such a waste of time. But, it's not! I see so many teachers on a daily basis coming in and saying, "What should I do today?" What?? How do you not know what you are doing today? I wish there was some way to have more interaction with my mentor. Honestly, I feel like I would learn SO much just from taking her AP course! (kinda sad) I would love to have her (especially last semester) spend more time observing me and offering suggestions. I think that student teachers in this field often struggle even more in trying to please their supervising teachers than other fields. After all, there are only so many ways to explain history, math, and science. The facts remain the same. This is part of the reason that I was glad to obtain alternate certification. Also, regarding turning in lesson plans- I don't like formal lesson planning at all. I feel like it goes against what we actually do. I do, however, always have my plans written out (first on a post it note or email to myself!) and always keep the objectives up on the board. I would love it if my mentor took a more active interest in my day to day plans. The reality is, she is far too busy herself! She spends hours and hours grading even after years of teaching experience! Thanks for posting about this topic – I feel like being a first year teacher is so lonely sometimes! Thanks for chiming in, Candace. You have some important points re: time. I'm glad you have a mentor. I didn't really have one. It's a shame you can't at least observe her class. I have asked my new teachers to observe mine as well as those of other teachers in the school. I read this p0st awhile ago, but didn't have a chance to get through all the comments till now. I'm a second-year English teacher and I feel like I'm struggling even MORE this year than I was last year. A large reason for that is the lack of time –trying to fit in grading, planning and life into each week is stressful. Not to mention dealing with paperwork for discipline issues, other duties involved with teaching, an extra duties you may have — someone I know once said that it's a wonder all teachers aren't alcoholics. As a second-year teacher I wish I had more time. I wish my mentor last year had had more time for me (we never really had actual mentoring discussions, time being a factor there too). I also wish I'd been taught better about what goes into planning a good lesson. I feel like I'm learning that more this year, but I feel bad for my students sometimes. Thank you so much for addressing this issue. As a future teacher, (and I am still a few years away from student teaching) I would feel much better if I knew that I was going into teaching and would have some help for a few years from someone who has experience. I think that it will be extremely stressful when I begin teaching becuase I will be doing every lesson plan from the very beginning! YIKES…I want to feel comfortable asking for help, and not feel that the eyes of my older co-workers are critical, but rather that they want to help me be a better teacher!